Technic: Copperplate engraving / etching with contemporary hand colouring on hand laid paper. Condition: Good, given age. Paper separation top and bottom middle fold; backed. Edges with a few tiny tears. Some small spots in the margins. Several creases. Original middle fold as issued. General age-related toning and/or occasional minor defects from handling. Please study scan carefully. 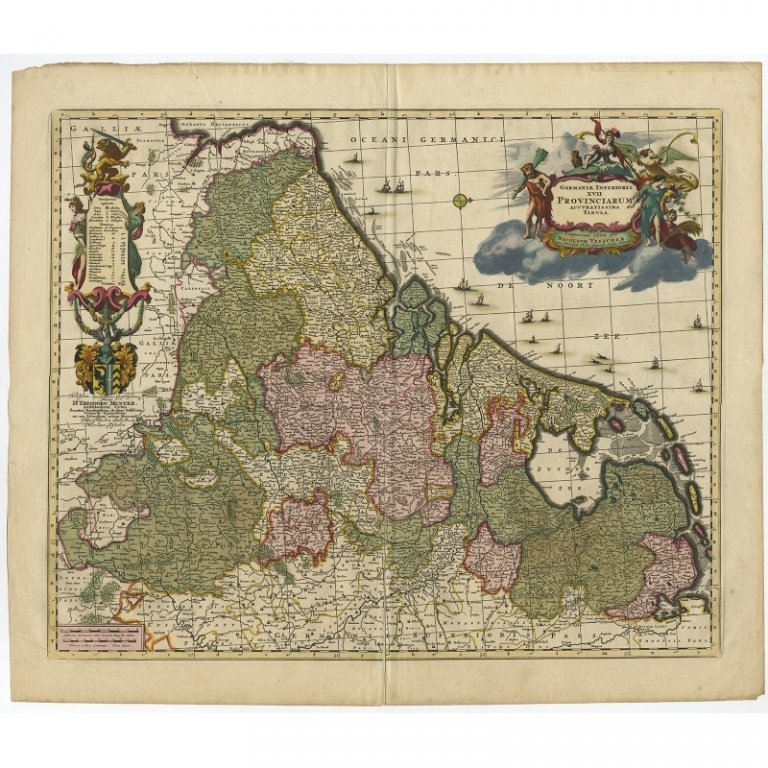 Description: Antique print, titled: 'Germaniae Inferioris XVII Provinciarum Accuratissima Tabula.' - Map of the low countries (17 provinces, Netherlands). The map is dedicated to Theodoro Munter. Embellished with a large and decorative title-cartouche and a cartouche with scales and a coat-of-arms. Source unknown, to be determined. Artists and Engravers: Made by 'Nicolaes Visscher' after an anonymous artist. For nearly a century the members of the Visscher family were important art dealers and map publishers in Amsterdam. The founder of the business, C. J. Visscher, had premises near to those of Pieter van den Keere and Jodocus Hondius whose pupil he may have been. From about 1620 he designed a number of individual maps, including one of the British Isles, but his first atlas consisted of maps printed from plates bought from van den Keere and issued as they stood with some additions of his own, including historical scenes of battles and sieges for which he had a high reputation. Some maps bear the latinized form of the family name: Piscator. 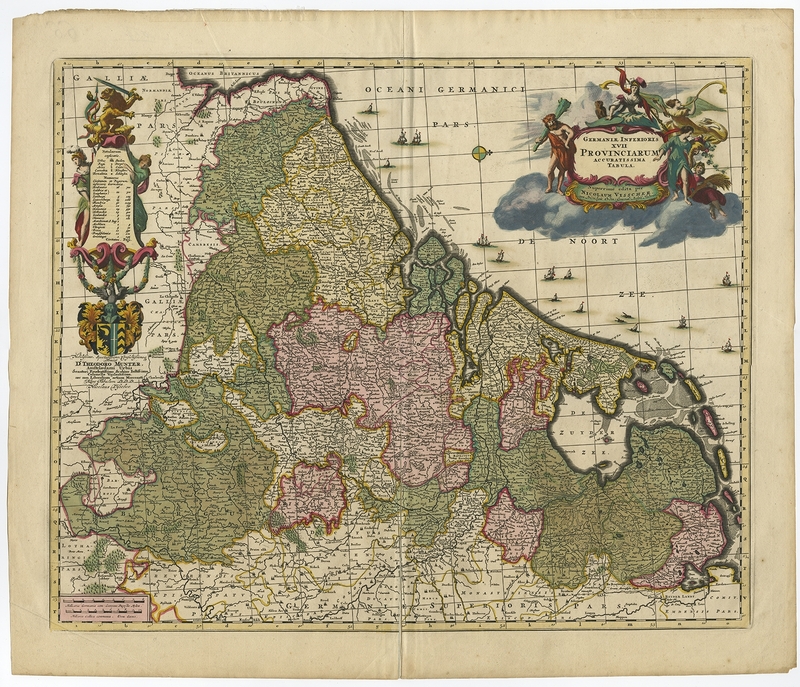 After Visscher's death his son and grandson, both of the same name, issued a considerable number of atlases, constantly revised and brought up to date but most of them lacking an index and with varying contents. The widow of Nicholaes Visscher II carried on the business until it finally passed into the hands of Pieter Schenk.